When storms hit, you need to be prepared. Let our team of professionals come and help design your generator needs. We are certified to install the best in stand-by home generators, Eaton Cutler-Hammer and also Generac. Different needs, specify different generators. Let’s say you only want to have your, furnance, freezer, sump-pump, and maybe some lights on to stay on if you lost power. There are different options to considers: you could get a nice portable unit, but that requires you to pull it to its starting place, plug it in, and then turn breakers on and off. Though this is sometimes a good option, it can lead to extra work on your part and possible safety issues. The other option is a smaller stand by unit, with control switches to only power up certain items in a case of power outages. The plus side to this style of generator is that it is automatic, so whether you are home or away your home is going to be protected during power outages. We also provide peace of mind for your whole home. Depending on your electricity usage, we can cover the entire house. We can also keep your air-condition, lights, freezers, T.V. and all other high priority items running during all power outages, from the gas line ran from your house to the unit, to the automatic transfer switch, everything will be professional, clean, orderly, and neat. 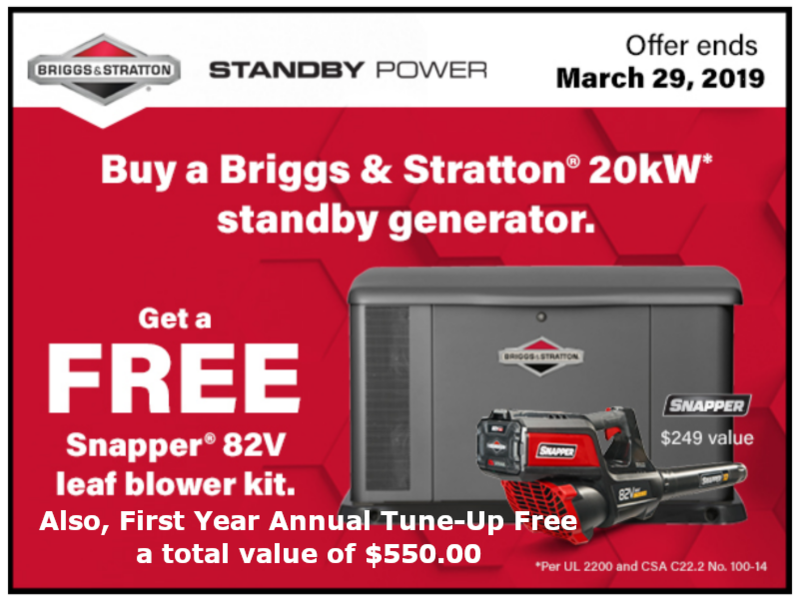 Generator Package includes complete system – delivery, gravel base, Generator – w Automatic Transfer Switch, connected to your home, and tested for proper operation.